One of the most iconic vehicles of all time, the Volkswagen Beetle continues to keep up with modern times while still offering the retro look so many people love. The first Volkswagen vehicle was the Beetle, and to this day it continues to impress drivers. The Beetle is the car for those who like to have fun and make a statement on the road. The Volkswagen Beetle Convertible is the Beetle we know and love with one adjustment: a removable top. The Beetle was already fun to drive, and now it just got better. Whether drivers are looking to enjoy a beautiful sunny day or ride in coupe style with the top up, the Beetle Convertible offers serious versatility. The luxury car drivers are looking for, the Volkswagen CC has a lot to offer. The CC is not only comfortable and stacked with great amenities, it looks good too. Elegant styling, luxury features, and impressive performance come together to make the CC a premium car without the premium cost. Looking for luxury and versatility? 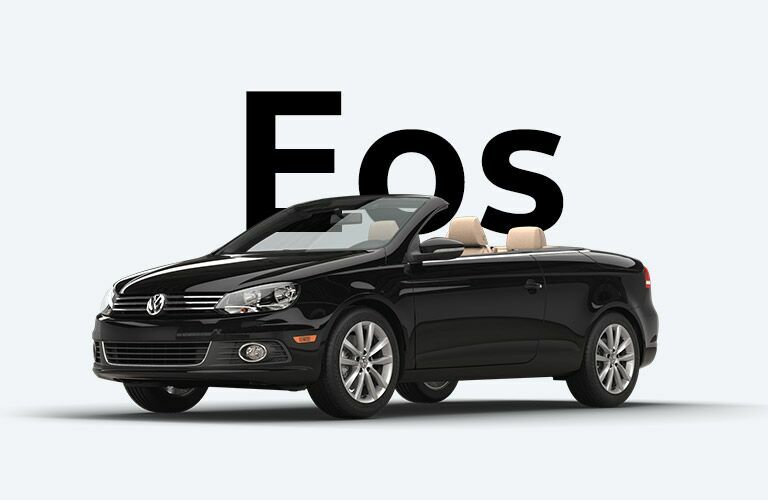 The Volkswagen EOS is a convertible hardtop that also has a panoramic power sunroof. With the EOS, drivers can blend in with the other sedans or add some style to enjoy a beautiful day. Comfortable and luxurious, the EOS provides a fun, exciting ride in any type of weather. Versatile, efficient, and fun, the Volkswagen Golf is still a fan favorite. This hatchback has the space and versatility drivers need, while offering the power of choice through multiple trims and models. Whether drivers have a family or simply need a good commuter vehicle, the Golf is the perfect car for wide range of people. Take the Volkswagen Golf and kick it up a notch and you have the Volkswagen Golf GTI, the original hot hatch. The Golf GTI offers the space and efficiency of the Golf, with the added bonus of a more stylish design and sportier performance. Those looking for a Golf with a boost will love the Golf GTI. The Volkswagen Golf R is perfect for those who love to live life on the edge. With incredible performance and power, the Golf R is the powerhouse of the Volkswagen family. Elegant styling and unmatched performance come together to make the Golf R the perfect car for anyone looking to experience serious thrills on the road. Wagons have long been thought of as slow, boring family cars. All that is about to change with the Volkswagen Golf SportWagen. The Golf Sportwagen combines serious versatility and space with style, power and efficiency. Perfect for the family on the go, the Golf SportWagen is ready for an adventure. There is a reason the Jetta continues to be one of the most popular Volkswagen vehicles. Incredible efficiency, comfort and style come together to make the Jetta a prime choice for those looking for a compact sedan. With great model options like the sporty GLI and highly efficient TDI, there is truly a Jetta for everyone. The Volkswagen Passat has a sleek design, serious comfort, and cutting-edge features, allowing this sedan to offer more than your typical family car. Efficient and spacious, the Passat is a step-up in size from the Jetta and is perfect for those looking for a little extra passenger space. The Passat is the family-friendly sedan drivers are looking for. The Volkswagen Tiguan is the compact SUV drivers have been waiting for. Incredible performance, serious versatility, and cutting-edge amenities make the Tiguan the perfect SUV for a variety of drivers. With multiple trim options, buyers can choose the Tiguan model which best fits their needs and lifestyle. The Tiguan makes SUVs sporty again. The complete SUV package can be found in the Volkswagen Atlas. A powerful, full-size SUV with a luxury design and premium features, the Atlas is a highly capable family vehicle ready for any adventure. Whether drivers are looking to take the road less traveled or simply need the towing power, the Touareg is up for the challenge.